Home / John Cochrane - Grumpy Economist / Competitive deposits? In its death note to narrow banks (link to Federal Register where you can post comments; previous post), the Fed claimed charmingly that retail deposit rates are fully competitive, so we don't need a narrow bank option to help spread the interest on reserves to deposit rates. In the Fed's view, the fact that banks pay so little compared to reserves just reflects the costs (many of them regulatory!) of servicing retail accounts. "Some have argued that the presence of PTIEs could play an important role in raising deposit rates offered by banks to their retail depositors. 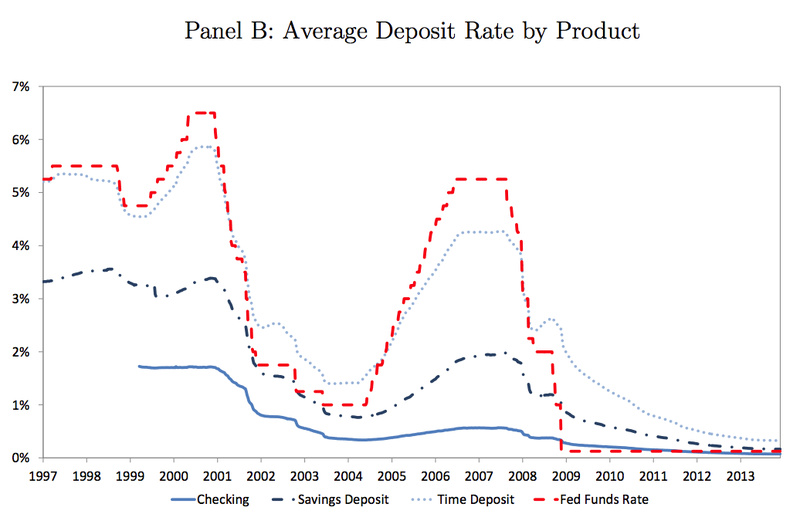 The potential for rates offered by PTIEs to have a meaningful impact on retail deposit rates, however, seems very low...retail deposit accounts have long paid rates of interest far below those offered on money market investments, reflecting factors such as bank costs in managing such retail accounts and the willingness of retail customers to forgo some interest on deposits for the perceived convenience or safety of maintaining balances at a bank rather than in a money market investment. 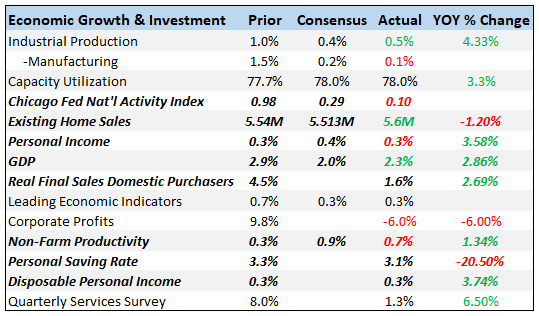 When the Fed Funds rate rises, checking account rates do not. 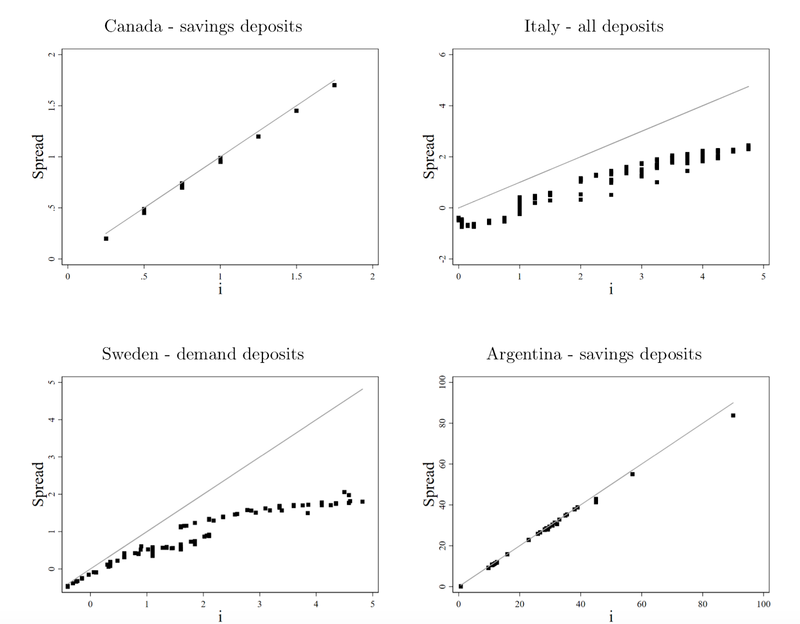 (It's interesting that savings and time deposits do move more quickly, indicating banks face more competition there.) 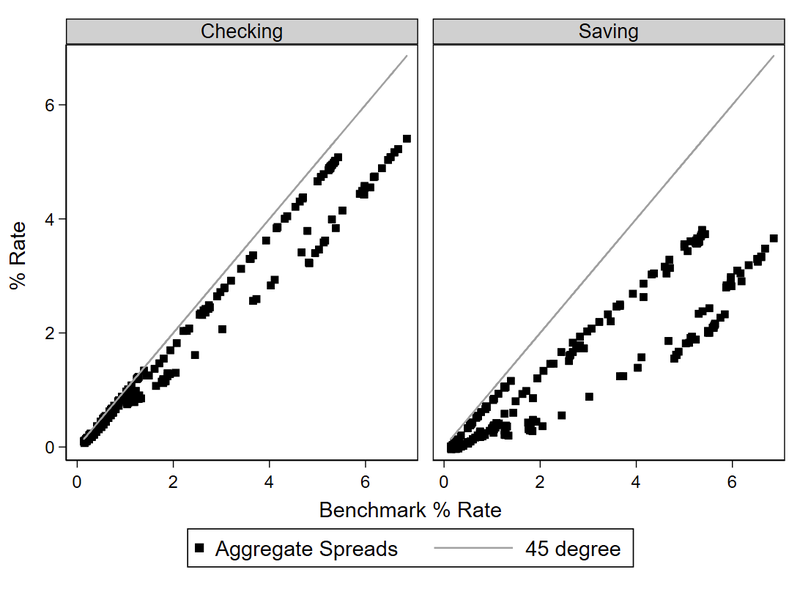 The Fed's story that the spread between checking account rates and federal funds (now IOER) rates reflects costs is very hard to square with this graph -- why should costs and benefits of checking accounts change over time so much, and coincidentally rise exactly one for one with the Federal Funds rate? It's interesting that Sweden and Italy have flatter (more competitive lines). It's really interesting that Argentina lies on the 45 degree line, with no pass through, despite huge inflation-induced interest rates. I would guess that Argentina has a law against paying interest rate on deposits, as the US used to have.